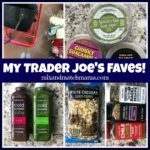 Did you see My Trader Joe’s Faves Post today? 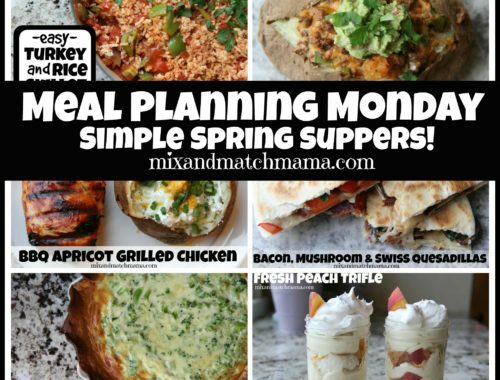 …to make a quick and easy weeknight supper! 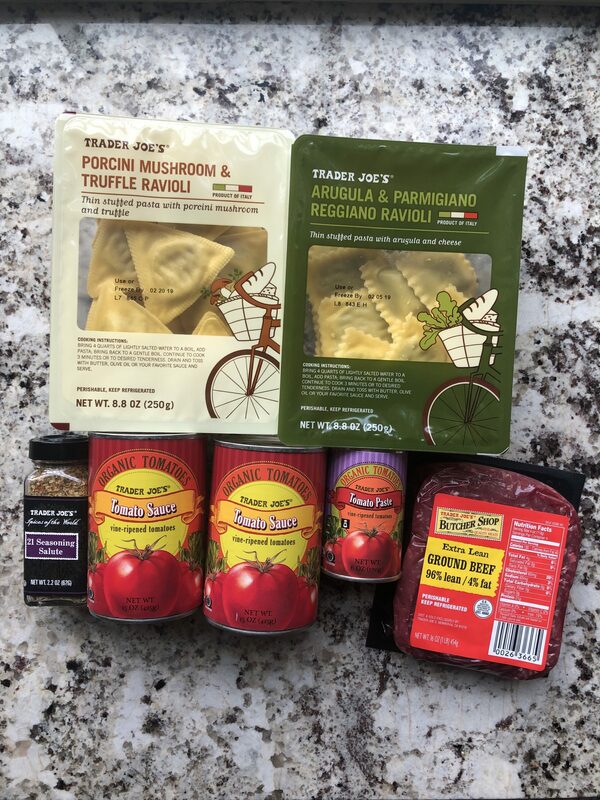 All you need is some ravioli (I bought two different kinds and mixed them), some ground beef, two cans of tomato sauce, some tomato paste, some 21 Seasoning Salute and then I added a splash of stock and topped it with Parmesan cheese. 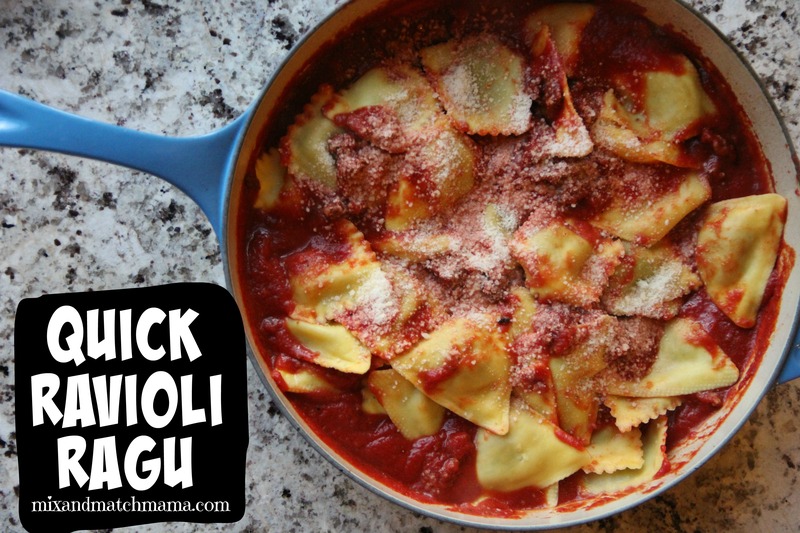 The easiest weeknight ragu whipped up in minutes! 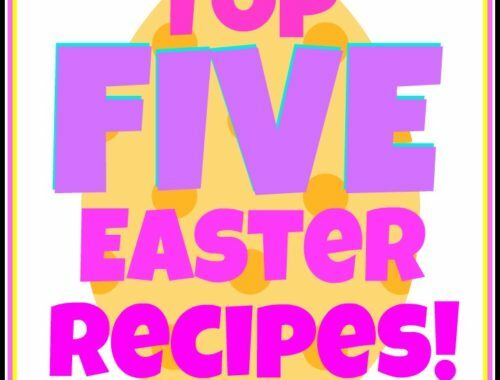 This recipe serves 4 to 6. If you don’t shop at Trader Joe’s, just substitute an Italian seasoning blend for their spice. In a large skillet over medium-high heat, brown up your ground beef in a drizzle of EVOO. Meanwhile, bring a large pot of water up to a boil for your ravioli. Once the beef is browned and crumbly, add in your seasoning along with your tomato sauce, tomato paste and stock. Bring everything up to a boil and then reduce heat to simmer while you drop your ravioli in the boiling water and cook to al dente (about 4 to 5 minutes). Remove cooked ravioli from pot, drain water and then toss it with your meat sauce. Stir everything together (be careful not to break your ravioli) and then sprinkle Parmesan cheese down over the top. 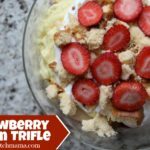 Easy, delicious and a family-favorite…all from Trader Joe’s! I’m thinking I should send you my TJ list for your shopping trip this week. ;). I’ll for sure be adding this goodness! You need to try the their butternut squash ravioli! So good! My two favorite TJ’s cheater dinners are chicken parmesan and chicken cordon Bleu. I use the frozen breaded tenders and 5 minutes prior to done, I add either the Italian cheese blend and marinara, or Mustard, black forest ham and Swiss cheese! Couldn’t be easier and always appreciated! 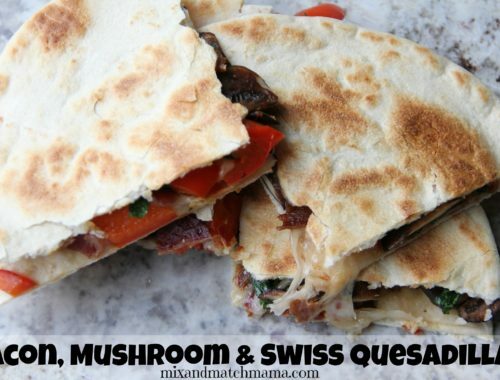 Sounds just as good as Shay’s TJ meal. . .I’m going to try this too!